On Wednesday, 57-year-old Levin man Billy McKee was found guilty in the Palmerston North District Court on four charges of selling cannabis and one of cultivation. Libertarianz Spokesman on Drugs, Dr. Richard Goode, described it as a day of shame for the New Zealand police and their political masters in the Beehive. Previous PostFLap Jacks Captian Knuckles Has Gone MetalNext PostThe Real Fleetwood Mac… Peter Green. The cops called it Operation Relief – targeting Billy McKee for helping sick people who need cannabis. 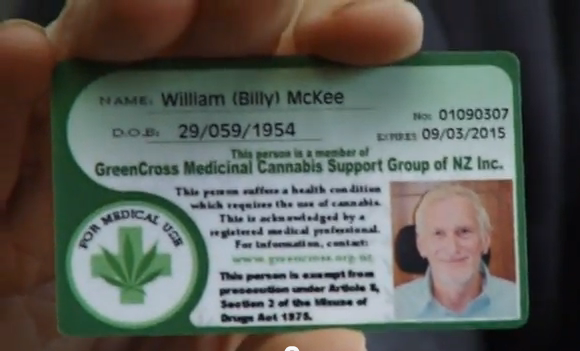 An undercover slimeball who went by the false name “Lee Michaels” contacted Billy through the Green Cross website. He pretended to suffer from severe migraines. Billy had a family member who had severe migraines and eventually died from a brain tumor – so he was genuinely concerned about “Lee Michaels” and wanted to help him. As a result of trying to provide help to someone he believed to be a genuine medical cannabis user, Billy was convicted of supplying and cultivating cannabis – another injustice of prohibition to add to a list that is already far too long. Hi Richard – well said – and thanks for linking to the Daktory site. Best wishes – keep flying the flag of liberty!